The MMS settings for T-Mobile on iOS 6. These are the exact same as iOS 4 and iOS 5. Currently the easiest way to get MMS working on tmobile is to jailbreak and install the fix from our repo. Now what happens if you have an unlocked iPhone 4S running on T-Mobile like I do? Well, right now there is no way to jailbreak the iPhone 4S and so you can’t get MMS working. Don’t worry, LEI Mobile has your back. If you have a factory unlocked iPhone and DO NOT want to Jailbreak or can’t Jailbreak but want MMS settings for T-Mobile I have a solution. 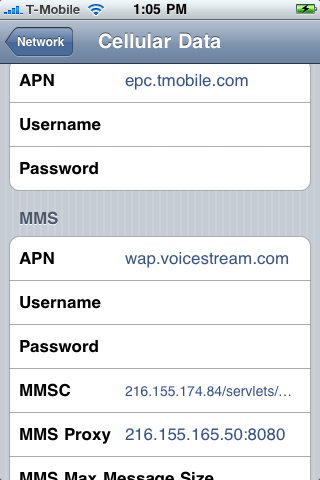 First off here are the correct MMS settings for T-Mobile on iOS 5. Please add our Cydia repo to find the iPhone MMS Fix for T-Mobile. To install our repository you will open up Cydia. Click on Manage at the bottom. Click On Edit in the top right. Click Add in the top left. Type http://beta.leimobile.com/repo/ and then press Add Source. Then Click on the LEI Mobile source and install the T-Mobile MMS Fix or the Simple Mobile MMS Fix if you have Simple Mobile. Now if you have a factory unlocked iPhone and do not want to jailbreak to get MMS working on T-Mobile you can do some tweaking to your backup files. 1. First things first. 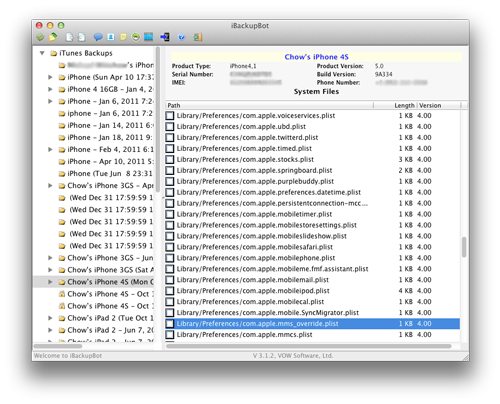 Make a full backup of your iPhone in iTunes. 2. Download the program iBackupBot. Make sure to select Mac or Windows. You may use the free trial, but it is best to purchase! 3. Launch iBackupBot and just hit OK to all of the messages that may pop up. It may take a while to load all the device information if you have multiple backups saved on your computer. 4. Once loaded you will want to find your most recent backup on the left had side and select it. 5. Next you will see a list of files show up in the right-hand box. Scroll down until you see Library/Preferences/com.apple.mms_override.plist. 6. Double click on the mms override.plist and it will pop up a box to edit the file. 7. 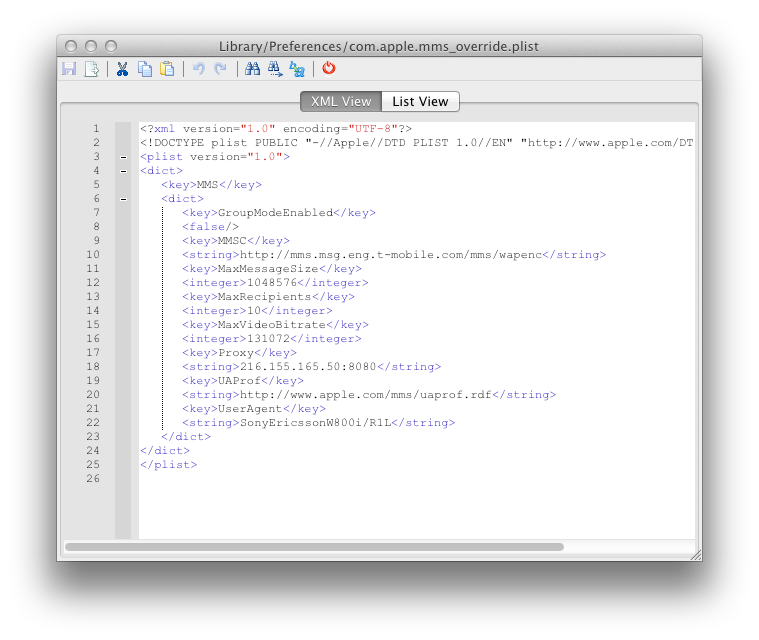 Download this com.apple.mms_override.plist (mirror link here) and paste the contents into the box or manually write it out based on the picture below. Then Save and Close the file. 8. Now put a check mark in the box next to Library/Preferences/com.apple.mms_override.plist and then click on File at the top and select restore. 9. iBackupBot will restore this new edited file onto your iPhone. Make sure you set your APN correctly and all of the other info is filled in. The cellular Data APN can be whatever T-Mobile gives you. The MMS APN must be wap.voicestream.com. 10. Reboot and enjoy MMS picture messaging on T-Mobile! I think I know what’s going on here. Basically there is NO WAY to get MMS to work on Tmobile (with iPhone) if the “Cellular Data” is not turned on. Everything I’ve read online seems to suggest this. MMS requires data, whether its EDGE, 3G, etc…If this is the case then I totally misunderstood what the above fix is supposed to do. What I don’t get is how MMS works with other phones without data. Like back in the day when many people didn’t have data plans they would still be able to send picture messages. I wonder if this issue is specific to certain phones like the iPhone. Will that ibackupbot do the same thing for Net10 APN settings that it dose for the T-Mobile APN ? Thank you for any help you can give me.